"In this autobiographical and metaphysical novel, White takes episodes from everyday life and paws at them until they reveal their hidden strangeness. In a scene that recalls a common childhood fear, the narrator describes how he once saw a vacuum cleaner in the woods and became convinced that it was a dead body. The case of mistaken identity is brought to its absurd conclusion when the boy actually does find a dead body on a Sunday school outing but insists, 'It's probably really just a vacuum cleaner.' Fellow hippies' memories of the '60s--told from the perspective of the 'quiet days of Reagan Good Feelings'--include the theft of a Spanish-English dictionary from the library in order to translate all the street names in a California suburb, and joining protest organizations after failing in an attempt to subvert Romper Room. 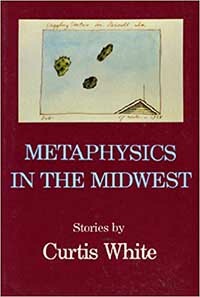 While the writing and narrative flow are sometimes obscure, the book is saved by White's sly sense of humor and his exhilarating way of jumping from cultural icons to grand and wacky theories."